Vidiot is a free non-linear video editor that lets you edit videos easily. Read our review of Vidiot here. 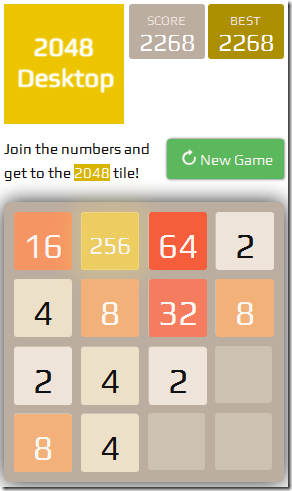 2048desktop is a free desktop based game where the main motive of the game is to move the numbered tiles in the grid blocks in order to get a sum of 2048. Smallx264 is a free batch video transcoder that uses Handbrake conversion engine. It comes with settings to convert videos to Android, iPhone, iPad format. SRTEd is a free subtitle editor that lets you watch videos and edit their subtitles. This is the easiest to use subtitle editor. Mosamic is a free mosaic creation software to create photos mosaics and color mosaics. Choose number of tiles in mosaic. Comes with wizard like interface. Windows Inspection Tool Set is a free software that shows running processes, installed modules, installed drivers, events log viewer, and lot more. Hddb is a very fast file search software for PC that instantly shows files and folders that match your search results. It is very light in size. Alternate Textbrowser is a free software to edit Text and HTML files. You can preview HTML and also open multiple files side-by-side. Geometry Visualizer 3D is a free software to create geometry models in 2D and 3D. You can also zoom and rotate models around different axes. InstalledDriverList is a free software to make a list of all the device drivers installed in system. It generates HTML report of installed drivers. DiskSmartView is a free software that shows S.M.A.R.T. information of hard drives. It is easy to use software and completely free. DiskImager is a free software to create image of a Flash drive or an external hard drive. It can also rewrite image back to the removal drive. Facebook Invite All is a free Chrome extension that lets you invite all friends to like a page or invite all friends to event in one go.